Sometimes boxing hands its fans surprises, outcomes that open doors to more exhilarating fights, and this is something that every boxing fan can appreciate and treasure. There are too many people out there, claiming that boxing is a lost sport, bringing less entertainment and claiming a miniscule number of new fans. While sometimes even I start believing such rumors, its fights like Miguel Cotto vs. Sergio Martinez that change my mind, bringing my thought back to where they belong: appreciating the sport and seeing it flourish. Weeks leading up to the fight, it was clear that the majority of boxing community expected Sergio Martinez to win the fight. Why? Some claimed that he was simply a fresher fighter, with better footwork and ring generalship. Truth be told, I was one of those people. Rummaging through various forums, I found that loads of boxing fans wholeheartedly believed that Cotto was simply too old and had been through too many wars. Some suggested that he was now devoting too much time to the business aspect of his career, and that maybe it would be wise for Miguel to hang up the gloves and dive into his promotional endeavors. Do Freddie Roach and Miguel Cotto have a magical biological time clock in their possession, capable of turning time back? It is no secret that Cotto can punch hard with both hands, but this was not the only attribute that regenerated Cotto and his career. The Puerto Rican was absolutely flawless in this style: he was quick, responsive, sharp and aggressive. He looked like the Cotto of 6 years ago: relentless. It would be unfair to say that Sergio Martinez crossed the ropes and fought in the fashion that we had all expected him to; something was off. Still, even if we saw an absolutely faultless Martinez show up to the fight, the way Miguel fought, no version of Martinez stood a chance. 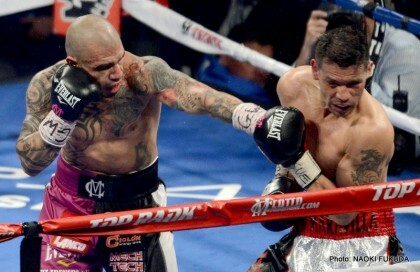 With his victory, Cotto gifted the boxing community a possibility of a few phenomenal fights. Will Cotto vs. Golovkin pop up on our radar next? Or will Mayweather Jr. jump on the opportunity for another high revenue fight in a rematch against Cotto? Who knows, maybe even a Canelo rematch will make its way to an autograph on a fight contract.